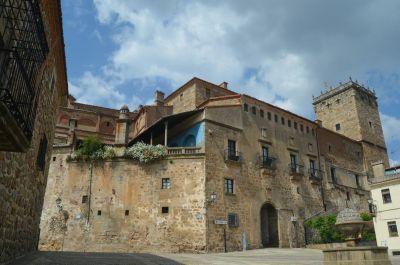 In Spain a vast Jewish Heritage can be found, and on this tour you will get a chance to discover some of the most emblematic Historic Jewish Quarters in Spain! Starting off the journey by arriving to Madrid´s Airport and then drive to Toledo where you will be based for 2 nights to explore the old Jewish quarter and Synagogue. What better way to understand about the history than with a Local guide who will give you an informative look at the city. In Andalucia you will visit the ancient Jewish quarters of Sevilla, Granada and Cordoba. Along the way you will be staying in the comforts of Paradors, Historic Hotel and charming Manors. Come follow the footprints of Sephardic Spain! - Visit MERIDA former Roman capital of western Spain with its magnificent ROMAN RUINS, AMPHITHEATER and the MUSEUM OF ROMAN ARTIFACTS. (on your own) Mon-Fri 10:00am - 2:00pm / 4:00pm - 6:00pm / in the museum & ruins they have guides to show you around. - Lunch and Dinner on your own, try one of the many restaurants located in the Santa Cruz. Even try a night out in one of the many taverns with live Flamenco dancing. - Relax the rest of the day, walk around and do some shopping in the city. - Take a taxi from your hotel to Barajas Airport. A NATIONAL MONUMENT The location now called TORRE DE LA REINA, was the rearguard settlement for one of the camps of king Ferdinand III the Saint, during the conquest of Sevilla. In the last years of the 13th century and the first of the 14th it belonged to Queen María de Molina, which explains the origin of its name. The enormous relevance of the Fortress lies in the fact that, besides its being a royal property, it is the only rural building from those times within Sevilla´s environment. The need to exploit the property made it necessary to enlarge the ensemble without taking into account its military nature. Hence, a rural Country Estate in the Renaissance style was organized, which acted as a model for other Country Estates and urban Houses in Sevilla. Due to the beauty of the surrounding Countryside and its location not far away from Sevilla (12 km. ), the ensemble has been converted into a small hotel with a small number of rooms. The visitor, however, finds here history and nature in full. At present, the whole ensemble has been declared National Monument. 11 rooms, car park, individual air-conditioning and heating, fax service, express-laundry, direct telephone line in rooms, satellite TV, swimming pool, gardens, conference and meeting rooms for up to 700 people. Within a few kilometres you find; golf, horse-riding, clay pigeon shooting, flying field.